2015 release from two US sonic astronomers working together in the “Berlin School’ style and featuring three long tracks recorded on tour in 2013! Space Music done in the “Berlin School” tradition by an American duo, one of which is extremely well-known to CDS Towers' customers already, and the other is about to be! From the stirring opening cosmic melody of ‘Star Cruiser’ you just know that you are heading off on a trip not only through the cosmos, but back in time (to the 70’s) as well! All the right elements and instrument sounds are there - Moog, ARP, OSI, Roland synthesizers, sequencer and Memotron choirs, strings, flutes etc., and each movement is taken at a languid pace with some manner of melody always present in one form or another. Great stuff if you are into this sort of thing… and we know there’s on hell of a lot of you out there already are! Plus, there’s no real hint that this is in fact a ‘live’ album at ant any point throughout the duration of the album, so without being given that information as we have done here, you would otherwise never have known. ‘Space Patrol’ is the product of a synergistic magic generated between Mike Hunter (a.k.a. 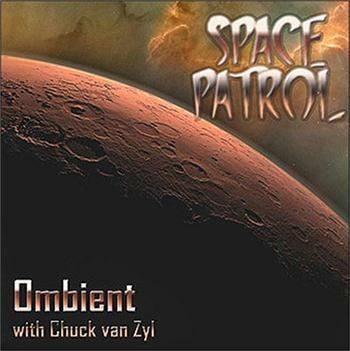 OMBIENT) and Chuck Van Zyl. Their four momentous, far-reaching concerts, held over a 48-hour period in December 2013, were realized in one weekend spent in high gear - on the brink of self-destruction. It was a time during which the duo seemed to have spent more attention on executing their music across four different venues than on maintaining any semblance of personal congruity. ‘Space Patrol’ is the resulting ‘live’ album. Taking the listener with it, into a realm without words, the music sustains your attention from the very first note. Held together by texture, melodic narratives and atmosphere, ‘Space Patrol’ propels the listener through a trackless void. Its sonic surfaces are rich, complex and saturated with meaning, as resonant melodies hide in huge vaporous spheres of sound. In a vocabulary of repeating patterns the duo navigates their own tributary of the “Berlin-School”. Dancing arpeggio notes, resonant analogue tones and interlocking percussion accents surge out of breathing synthesizer swells - while soft percussive chiffs and royal electronic bleeps echo out across vividly imagined distances. As deeply breathing chords stack up and sustain, machine-like synchronized sequencer runs gain momentum - cycling in lock step against a trail of echoes and dreamy tonal interplay. Hunter's analog style step sequencer, and its seemingly endless facility for composition, repetition and variation, drives this music's motoric tick-tock timing. Amidst this kinetic kaleidoscope of rhythm, Van Zyl releases a ribbon of heroic synth leads, as well as soft Mellotron flutes, strings and choirs. The beauty of this work comes from its many strands, heard individually and comprehended collectively. At the centre of ‘Space Patrol's three tracks is an area without form. Although possessing a shape, no one will ever completely explain the mysteries of this hot spot. The expanding soundfield has apparently left a gap in this region - for reasons that are not yet understood. The zone invites multiple interpretations, and while its meaning may be slippery, its power is unmistakable. In a compulsively detailed swirl of moods and impressions, this duo is pulled toward a hard chill - and the revivifying power of creativity. Mike Hunter and Chuck Van Zyl create a realm so complete, the most difficult part of their ‘Space Patrol’ will be the return to Earth. ‘Space Patrol’ was released on 28th May 2015.